I can remember my Dad racing home furiously in our Volkswagen Beetle, hoping to drop us in front of the television before the pilot for the 1970s Incredible Hulk began. We rarely missed an episode, and read the comics together from my youth into adulthood. It became such a father/son bond that in 2003, he came up to see a midnight showing of Hulk, the oft-maligned Ang Lee outing that these lifelong fans did not find lacking. As the familiar piano music of the “Lonely Man” theme plays (which always accompanied the fugitive Banner in the 70s show) I find myself a touch melancholy seeing the sequel without my father, who passed away in 2005. With decades of watching, reading, and relationship intertwined with this less than jolly green giant, I hoped 2008’s movie would truly live up to it’s added adjective: “incredible”. I’ll answer the question on everyone’s mind (and make the Hulk angry – you wouldn’t like him when he’s angry): as far as the films go, The Incredible Hulk is NOT as good as its recent Marvel movie brother, Iron Man. The way THAT film took off and blew the pop-cultural consciousness, I’m not sure there’s any way even The Incredible Hulk could have delivered the same punch. Director Louis Leterrier’s style is complementary to Jon Favreau’s, but the pacing, effects and editing fall short of the heights to which Iron Man soared. Still, it IS evident that Marvel Studios is creating something of a house style, and the film fits nicely in the same stable as Iron Man. From the opening credits showing military equipment by Stark Industries to the ending scene with Robert Downey Jr. the film takes its place as a successful, enjoyable installment in the expanding “Marvel Universe“. As the character and narrative are not intended to be as light as this summer’s Iron giant, the new Hulk film falls tonally somewhere between the Iron Man and X-Men films, probably due to the fact that screenwriter Zak Penn wrote both X2 and X-Men: The Last Stand. Curiously, the film also received rewrites by Ed Norton, who lends a gravitas to the film that can’t be denied as the tormented man-monster Bruce Banner. A fan of the television show and comics, Norton embraces the character and his devotion is evident; the film is very accessible, yet the references to both television show and comic book are too numerous to count. Unfortunately, Norton’s moments are always a bit too brief; the film lacks the weight and depth it would have had apart from the fast-paced editing of the director who gave us The Transporter. This is a film for action fans and comic book fans, whereas Ang Lee’s 2003 film truly explored the depths of Banner’s psyche – the frustration and rage that might truly birth such a behemoth. If the first feature film was too ponderous for the general movie-going population, this reboot is a little too fast and furious, and would have benefited from a few more minutes of contemplative personality (even some human interaction in the trailers didn’t make it into the final cut; hopefully an extended, “hulked-out” DVD will balance this out). Make no mistake, this IS a “reboot” to be sure; although not an origin story, the Hulk’s creation is shown in flashbacks in the opening and clearly draws more from a blend of the early comic book relationships and the 1970s Hulk creation. 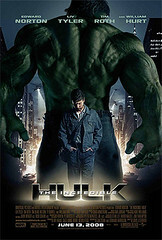 After a gamma radiation experiment unleashes Banner’s inner green monster, the scientist flees from both his girlfriend Betty (Liv Tyler) and her father, Army General Ross (William Hurt). 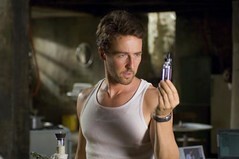 Banner is hiding out in Brazil, networking with another scientist to study his condition and find a cure before the military can capture him and use his body chemistry to create super-soldiers (human weapons of mass destruction). After Ross dispatches a team to collect Banner, led by combat veteran Emil Blonsky (Tim Roth), circumstances draw Bruce back to Betty, then cross-country to New York, in search of a cure. When another experiment goes wrong and creates a gamma-powered Abomination, Bruce must decide if unleashing his own demon is a wise solution to stop the even greater menace. The acting is solid for an action film; much like an artist brings his own rendition of a character on the comics page, Norton captures Banner’s tortured nature as well as both Bixby and Bana have in previous incarnations. Liv Tyler does not match Jennifer Connolly’s grace and nuance, and the chemistry with her co-star is less intense, but there are moments that succeed in capturing their ill-fated romance. Despite having a fairly one-note character in the sparse script, Tim Roth breathes some life into Emil Blonsky, and surprisingly enough – while I thought no one could match the grizzled Sam Elliot – William Hurt plays considerably against type and brings a haggard, bulky and gruff weight to General Ross that actually mirrors the original comic character more closely. While the film is clearly a lighter action vehicle than its green predecessor, it is more than satisfying as a summer film for ’08; The Incredible Hulk easily pounds Prince Caspian, steps on Speed Racer, and has aged better than Indiana Jones. 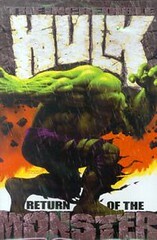 As a teenager, I loved The Incredible Hulk because he represented a cool, comic book outlet for all of my bottled up rage, my dark sarcasm, that tension between lashing out at abusers and becoming one myself. As an adult, I came to realize he represented all the dark impulses I wanted to suppress… the brokenness I didn’t want others to see, the parts of my nature I knew needed to be restrained. However, I also came to understand that despite behavioral psychology and medicine, these things could not truly be repressed or reconciled by human design. The story of the Hulk is a tragedy because it is a metaphor for the sad search of man seeking salvation from his darkness which, ultimately, nothing contained on this planet or even the Marvel Universe can rectify. I thank God that my dad not only sat me in front of the television to watch the Hulk, but he also taught me about where the cure for this shattered world – and my own brokenness – could be found. Below: listen to the audio presentation given after a live showing of the film! Mars Hill Rocks, so does HULK! Does Stan Lee ever explain why Hulk loses every other part of his clothing except his pants. To me that is the most amazing feat of physics in the Marvel Universe. For those bad boys not to explode into a cloud of fabric is a miracle…especially because the gluteus maximus is the largest muscle in the human body. But I guess we can’t have the incredible ‘tool’ swinging out in the open for Betty and everyone else to see. Little crass, sorry. Actually in 2003’s HULK by director Ang Lee, he DID lose the clothes twice and only had pants on after the military caught him and put him in something that seemed to be a really hefty spandex number. Also, comics writer Peter David and even Ed Norton in the second film take the time to purposely buy huge, oversized pants with elastic waistbands. 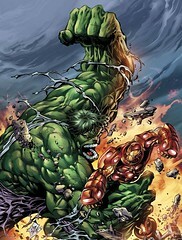 This way he breaks the belt that holds it up each time, but the Hulk doesn’t go starkers.